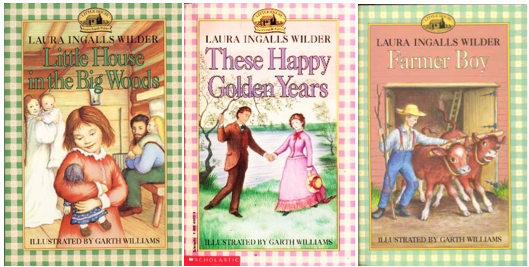 I was pretty obsessed with the Little House books, by Laura Ingalls Wilder, growing up. I had my favorites (most perversely The Long Winter was among them), but These Happy Golden Years was the one I read by far the most for obvious reasons. Romance. You can pick any of the characters from the series to marry, date, or dump today. I’m picking Almanzo Wilder, Cap Garland, and Mr. Edwards (although I was very tempted to put Pa in the mix). Hope you have fun returning to a pioneer state of mind! This entry was posted in Marry Date or Dump and tagged books, Laura Ingalls Wilder, Little House in the Big Woods, These Happy Golden Years by Alison Doherty. Bookmark the permalink.